“Money is an amazing, device without which modern civilization could not function but its introduction and development as a debt-credit accountancy system in the context of an increasingly labor-displacing, intensive capital producing system, involves a number of fundamental issues of which we must become aware of and for which we must compensate through a new economic orthodoxy. Keynesianism is dead. Let us actively bury it and move on, rather than let the corpse rot and its disease destroy the natural creative resourcefulness of nations”. Wallace Klink, Social Credit Archivist. Senior fellow of the Hoover Institute, Niall Ferguson, in The Sunday Times July 30th pointed out his exasperation at the collapse of an effective Trump presidency due to on-going crises. As a result, meaningful legislative reform on Obamacare, infrastructural development and tax reform will not be forthcoming, he reckons. He believes we are going through a social revolution of epic proportions and instead of meaningful World leadership we are presented with a tragic, soul destroying, soap opera. “Meanwhile, in Silicon Valley, the plan to render most Americans – and most humans – unemployed goes smoothly forward. ….. Despite overwhelming evidence of the accelerating pace of technological change, we humans remain chronically bad at making realistic projections about our economic future…… There are 3.5 million professional truck drivers in America. It is the most common job in most states. But the reality is that they sit where drivers on horse-drawn carriages once were: on the brink of unemployment…. Nor are they alone. Nearly half of the jobs in America are at risk of being automated over the next decade or two, according to Carl Frey and Michael Osborne of Oxford University. Looking at global employment, the McKinsey Global Institute recently concluded that “half of today’s work activities could be automated by 2055, but this could happen up to 20 years earlier”. Trump voters thought it was globalisation that destroyed the good jobs in American manufacturing. In reality it was globalisation and technology. Now technology is getting ready to destroy the not-so-good jobs too…… The goings on in Washington are the comedy politics of a distracted age. But the more attention we give Donald Trump on Twitter, the less we pay to the economic revolution going on all around us. The future belongs to robotics, not fubatics (dysfunctional politics)”. In 2007 I recognised the importance of this issue but I had no idea the problem would morph into such a crisis in so short a time. I understood that structural job substitution was going to be long-term, which would mean an on-going contraction of purchasing power. I felt this crisis demanded governmental policy change of the first magnitude and sought like many others to sound the alarm. I quote some paragraphs below , which I think need to be re-iterated, in light of, among others: the continued gargantuan expansion of Amazon to the utter destruction of conventional retailing; the total automation of trucking in the port of Rotterdam, the biggest port in Europe; the explosive growth of automated “tellering” and restaurant servicing; the decision by the European Commission and the British Government to ban petrol and diesel cars by 2040, thus heralding in the era of driver-less electric cars and trucks; the rise of artificial intelligence in the field of computer programming, thus allowing computers programme themselves; the near monopoly of trading in all equity, currency, commodity and bonds markets by quant and algo programmes and the unstoppable trend for all major manufacturing and agricultural processing to be relentlessly streamlined by robotics due to market cost competition. “Why is purchasing power so important? It is fundamental because without money no exchange can take place. In order to understand what I am talking about let us look at the historical example set by Henry Ford. He completely redefined "classical" economics through the policies undertaken by the Ford Motor Company in the 1920's. Under "normal" theory it was assumed that a corporation could only maximise profits by increasing price and limiting supply. Ford did the exact opposite because he had a more holistic view of the role of the corporation in society. He understood the synergetic relationship between money and goods. He doubled the wages of his workers, decreased the price of the Model T and in the process remade the Ford Motor Corporation. (This policy was not inflationary because he knew he could at least double production through increased efficiencies when he doubled wages. This is the essence of the enlightened policy of credit for productive communities rather than for monopoly elites). The company boomed. How did this happen. It was axiomatic for he understood the importance of money and purchasing power in communities. With Ford's workers able to make a good living, their financial anxiety ceased and staff turnover dropped by a multiple of five in one year. This dramatically decreased management expense and increased productivity. Workers finally had peace of mind. With the increased disposable income in the Detroit area the general economy boomed. All classes of economic sectors expanded. As a result more workers, new business owners, company managers, insurance brokers, real estate brokers, bankers, salesmen, craftsmen, delivery men, builders, farmers and retailers could afford Ford cars. Demand for the model T doubled then quadrupled through the increased buying power WHICH HE HAD CREATED. Accordingly profits at the Ford Motor Company dramatically improved as a result of his innovative policy. Ford understood economics and he understood the issue of PURCHASING POWER. FOR HIM PURCHASING POWER WAS NOT CREDIT BUT CASH. HE REASLIZED THAT WITHOUT THE MONEY TO PURCHASE HIS CARS POTENTIAL DEMAND WAS IRRELEVANT. THEREFORE HE REDISTRIBUTED DIVIDENDS FROM THE OWNERS TO THE WORKERS. THIS BRILLIANT INSIGHT MADE THE FUTURE FOR THE COMPANY. It built up the economy of Detroit and it helped define America as a country where a factory worker was respected and well paid, not exploited, as had been the case throughout the English industrial revolution. The American dream was Ford’s vision made manifest. It was a dream brought to fruition not through political fantasy but through the laws of accounting, finance, production and marketing”. What is happening today is the exact opposite of Ford’s policy. Worker purchasing power is being relentlessly destroyed not dramatically increased. As outlined above by Niall Ferguson unless active World leadership gets progressively involved solving this major problem the wealth disparity throughout the globe will dramatically rise over the next decade with two distinct classes emerging: plutocratic elites and techno-serfs. Such a development would bring great social instability and I solemnly hope and pray that a new economic orthodoxy, such as the Social Credit paradigm of Major Clifford Douglas, is finally understood and applied before it is too late. Keynesianism is dead, it is time economics moved on. Short Term Trend: Bullish Breakout. McC. Oscillator: Middle Of Range. 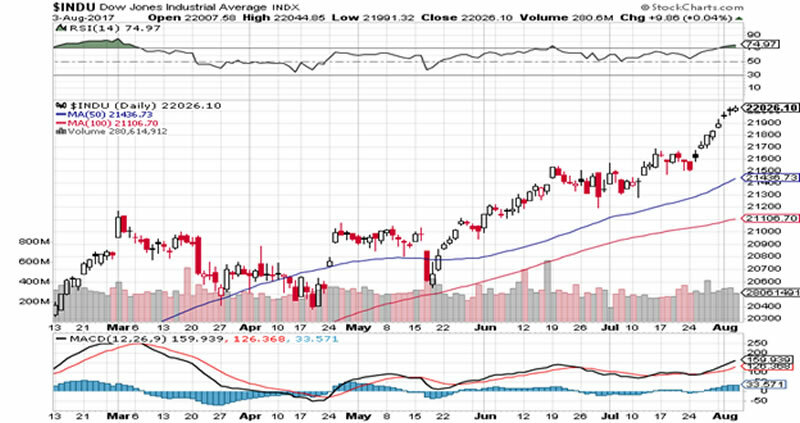 Dow Theory Indices Diverging Thus Caution Is Warranted. The Trump bull rally continues with a new breakout recorded on the Dow Industrials on the 26th July. 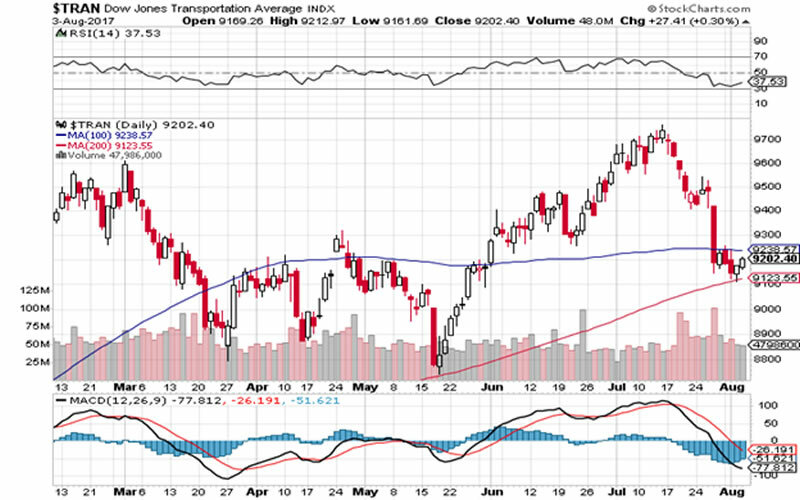 However, in Dow Theory parlance an important divergence has developed between the Dow Industrials and the Dow Transports. If the 8, 818 price point on the Trannies is broken and held that index will be in a bear trend, having significantly sliced through its 200 daily moving average making it by far the weakest of the main indices. While this potential event will not be earth shattering very often, with such divergence, experience has shown it would indicate increased market risk and could be a warning that a significant correct may be in the offing. Thus major caution is warranted. Chart: Dow Industrials 3rd. August 2017: Daily. Chart: Dow Transports 3rd. August 2017: Daily. Reference: “Team Trump has gone to the Reservoir Dogs, leaving the door open for robots”: Niall Ferguson, The Sunday Times July 30th 2017.